I will also say this: in the first few years of my career, I really did not like cats. But that changed after I learned about cats at the NAVC Conference, about their behavior, and about how you should treat cats and their owners. So I hope that, especially for the “non” cat lovers, reading this article will help you work with cats better. When I started working as a veterinary technician 22 years ago, our clinic was a mixed one. We treated livestock, horses, and small animals. I worked in all three areas, as did the veterinarians. I can tell you that it was not easy. I needed to have knowledge about so many different animals and to develop the skills to treat them. For instance, imagine that one Monday, you are out in the fields assisting with a caesarian section on a sheep. Next, you must address a cow with milk fever. You finish your morning with a horse that has colic and an upset owner. Then you eat your lunch, grab yourself a clean shirt and pants, and go back to the veterinary clinic to start office hours for the small animals. Your first client is a cat lover holding a carrier with a longhaired cat in one hand and an article from the internet in the other. Those of you with many years in this profession may recognize this situation. For the rest of you, believe me, it was a big headache. We had vastly different animals and different owners, and we had to help them all equally, to do the best for every animal and owner. For me, the cats caused the most headaches. They were opinionated and difficult to handle. And when my colleagues and I talked afterward about appointments, our opinion was always that the cat owners had exactly the same characteristics as their cats. Our practice finally split a few years ago into 3 sections: small animals, livestock, and horses. That was the first step toward improving our care for all our patients. Our second step was to become cat friendly. In January 2014, I attended the NAVC Conference in Orlando. On the second day, my colleague and I went to an early morning breakfast lecture. I left the room hungry because the topic was so interesting that I took notes throughout and had no time to eat anything. The subject? A cat-friendly practice. After that lecture, I took my personal schedule of lectures—which I start making up about 3 weeks before the conference—and threw it all away. Instead, I looked for everything about cat-friendly practices and procedures, cat behavior, and any other subject with the word “cat” in it. That was a big change because, normally, I went to lectures with subjects I love, like anesthesia, dog behavior, public relations/marketing, and horse topics, and as I mentioned, I really did not like cats. I thought they were difficult, incomprehensible, and could hurt you too much! Lucky for me, the first lecture was one of the best I ever heard. It was about cat behavior, and the presenters had several great video clips with good examples that showed problems between cats, problems between owners and cats, and situations in the living area of cats that caused problems for them. This lecture was an eye opener for me. Afterward, I understood a little bit more about cats and a little bit more why cats and our practice were not always a good match. For the rest of the conference, I soaked up lots of information, and I closed it with a hands-on lab about stress-free handling of dogs and cats. I LOVED it! I think this kind of course should be mandatory for every vet and vet tech all over the world. I learned to stop fighting my feline patients and start thinking. When you try to eliminate stress for cats, it is much easier to treat them. FIGURE 1. 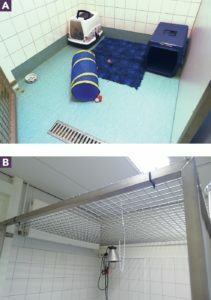 (A) A converted isolation cage with hiding places and toys for cats. (B) The mesh roof of the cage. Every team member had to read and learn the information book we made about cats and their handling. Some physical parts of the practice had to become more cat friendly. The handling of cats had to be addressed. Our information for cat owners “on paper and in words” would be updated. The plan became a team effort and team building experience. After the practice closed each day, we started to renovate, paint, and spruce up our 2 buildings. It’s an amazing feeling to be standing on a table, painting the walls (with more paint in your hair and on your face than what’s on the wall), and to look around and see your colleagues making jokes to each other as they work toward a common goal! That’s the spirit of a vet clinic. FIGURE 2. Cat cages with double doors. When the doors are closed, cats can hide behind the solid door to feel safe. We converted a quarantine cage for dogs into a space for cats. These cages are huge—150 cm (about 5 feet) on a side. So we put a roof on one to use it for cats that had to stay more than one day. We created hiding places inside the cage with a big cat carrier and a cardboard box. A tunnel is also fun for cats to explore, and we added a big covered litterbox and a large, soft bed. Before putting a cat in, we use Feliway to keep it from soiling outside the litterbox. So we created an environment with as little stress as possible and made it interesting and fun for cats. For most feline patients that are not very sick, it’s perfect (FIGURE 1). We put double doors on our cat cages so that we can approach the cats through 2 doors and not have to be right in front of their noses. Also, we covered one door of each cage so that cats can hide behind it (FIGURE 2). I’d say that 95% of our feline patients make use of this feature. Cats that stay a while in a practice may feel less stress when they can hide. When you give them sedation, they can hide and relax, and your anesthetic will work quicker and more effectively. FIGURE 3. 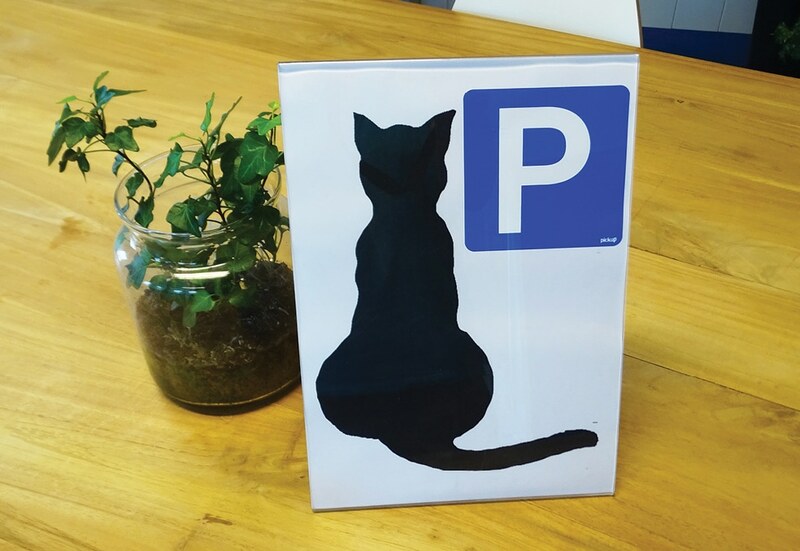 “Cat parking” sign at Dierenkliniek Winsum. We put locks on the consulting rooms because we were always trying to keep the cats on the exam table. But why? The examination takes only about 40% of the visit, and for the rest of the time, you are talking with the owner or typing on the patient’s chart. As for the cat, it’s so stressful for it to stay on the table and be held by the owner, vet, or vet tech. When we lock the door, we can let the cat walk freely in the examination room. This works extremely well. We placed a big table in the waiting room so clients can put their cat carriers on it. Dogs cannot approach it, and the cats cannot see other animals in front of their carrier door. Adding a “Cat Parking” sign on the table is ideal (FIGURE 3). 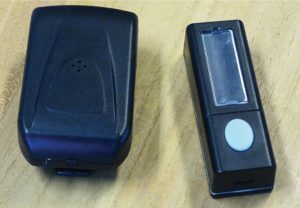 We bought a wireless doorbell that runs on batteries (FIGURE 4). We give the bell to the owner and keep the button. When it’s time to come into the examination room, we push the button and the owner gets a bell signaling to come in and go straight into the examination room, allowing the owner and cat to skip the waiting room with its noises and smells. The doorbell is also handy for situations like euthanasia. When the animal passes away, we bring the clients something to drink, and they can stay as long as they want in the room and say goodbye to their friend. In this instance, we give them the button and keep the bell ourselves. When clients want to leave or have a question, they can push the button, and we hear the bell and come to them. FIGURE 4. Wireless doorbell for client signaling. We now use an insulin syringe for intramuscular injections for sedation. While the vet tech is petting the cat, the vet can give the injection very slowly. In our experience, about 90% of cats do not react to the injection. When a cat is afraid to have blood taken from its neck, we wrap it in a towel and take the blood from the inside of a hind leg. In the past, we sedated many cats to take blood, but now it’s almost never necessary. 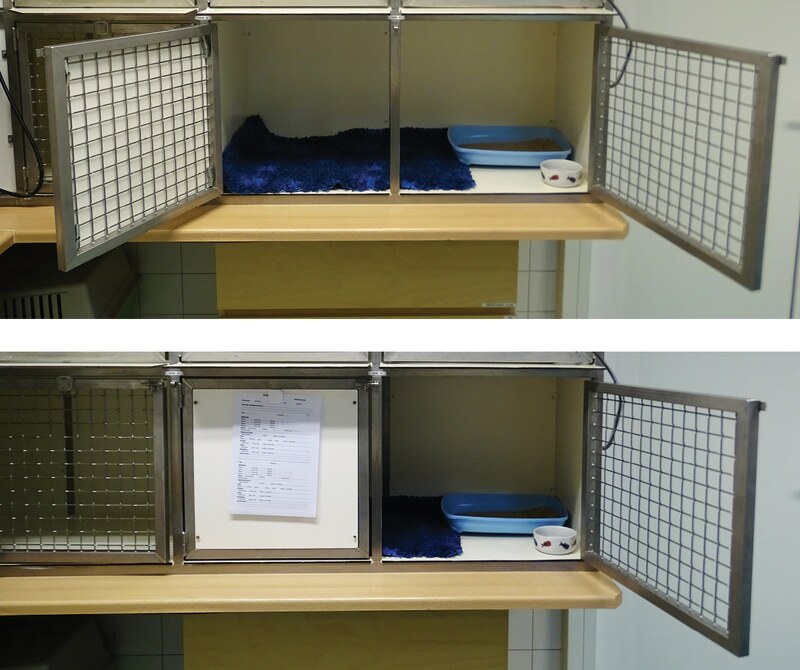 To take blood pressure, we put the little machine inside the cat’s cage. I’ve seen this greatly reduce a cat’s stress. I can tell the machine to measure again and again so we have a good average. On the other hand, for cats that are really relaxed with their owners, we can measure blood pressure on the owner’s lap. We made a flyer that explains how to transport cats. At our practice, we also sell “cat-friendly transport boxes.” I think owners do not always realize they are already making their cat anxious at home. They take the cat carrier out and grab the cat, and then they put their pet in a strange-smelling, dark cage and close the door. I ask them, “Can you imagine yourself grabbing your child by the neck and putting him or her in a laundry basket? Would you put a cover on the basket even while your child is screaming and struggling, then put the basket with the screaming child in your car to drive to the doctor?” I know that at least 99% of children treated like that would be completely stressed out when they arrived at the doctor’s office, and when they were let out, if anybody tried to touch them, they would kick, bite, and fight back. Then, in the future, when they saw the basket, they would run away or start kicking and fighting immediately when approached. So…cats are not that strange! Our job is to explain to owners how they can teach their cats that the transportation box is okay and how they can get their cat accustomed to going somewhere in the car. Finally, we sell cat toys and explain how important it is that owners enrich the lives of their cats. Less stressed cats are happier and more relaxed, which makes them much easier to treat. Less stress for the cat is also less stress for the owner. The result? Clients come more readily to the clinic, because they are not scared about their cat being completely stressed out. They are also happy and satisfied after the visit. Less stress for the veterinary team means less “fighting” with a cat. Now, everything that is happening with the cat is super relaxed. The result is that we have all started to love cats more and more! We gained new clients because they heard from friends or saw on the internet or in the newspapers that we are cat friendly. We’ve had really great press because newspapers loved the story of a cat-friendly practice. Most importantly, we now know more about cats and their behavior. I advise every clinic to try this concept. I must be honest and say that while we will stay cat friendly, we are not AAFP approved and might not become so. We love how the AAFP helped us, but because all the patient information, flyers, and posters are in English, we cannot really use them in the Netherlands. But we will follow the AAFP guidelines as much as we can. I will also say that the hardest part is to change yourself. I think it’s very important to explain to the team that they really should try to adopt the “new” approach, but it works best when they see the results of it for themselves. As for you? Just TRY it! At my practice, we now love cats instead of seeing them as a “problem.” Funny, because the cats didn’t change. Only we did!